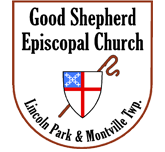 Good Shepherd Episcopal Church holds services each Sunday at its two campus locations in Lincoln Park, NJ and Montville, NJ. Please check the Worship Schedule for time and location of the weekly services. Our Monville church and campus (shown above, left) is located at 9 Two Bridges Road, Montville. Our church and campus in Lincoln Park (shown above, right) is located at 211 Main Street, Lincoln Park. A large parking lot is located in the rear of the church.